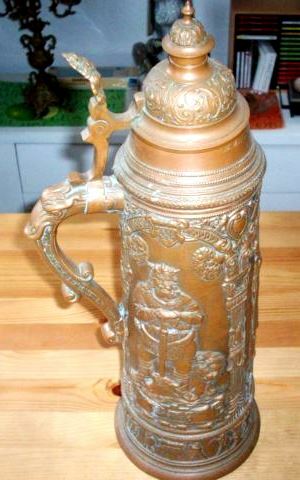 Steins made out of bronze, an alloy of copper and tin, are extremely hard to find, and when found are “usually” old and expensive, due to the process of making one. 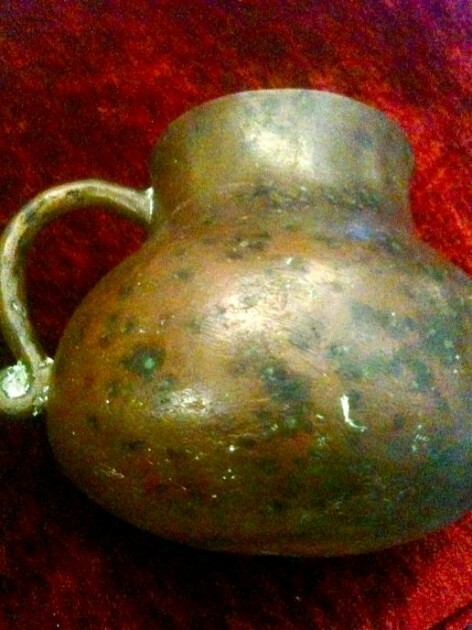 The reader wiil please compare the pig tail handle finial on this pass cup / gruel / soup bowl [?] with the example two above ▲ ▲. 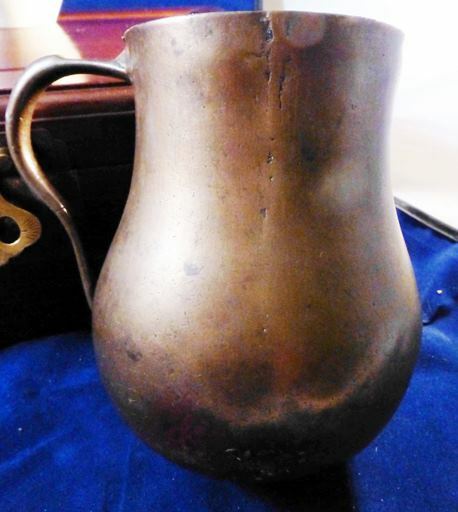 .The process of adding less or more tin to the copper and making the shades of bronze range from dark to light (looks golden) makes it a problem for the beginning stein collector in determining real bronze. 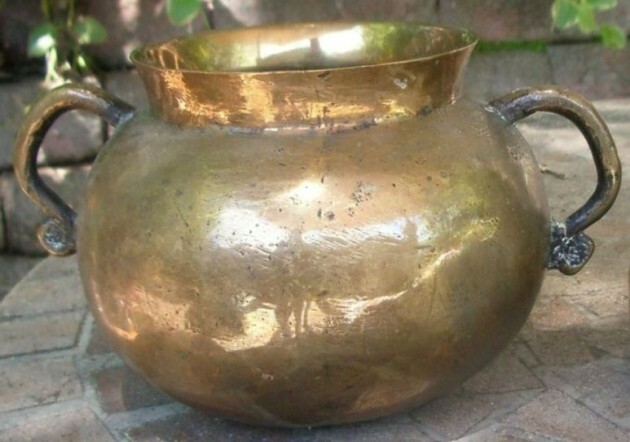 As bronze is slightly heavier than copper that may give some indication to collectors, but they should check and rule out the other alternatives (to the weight) as shown and described below. 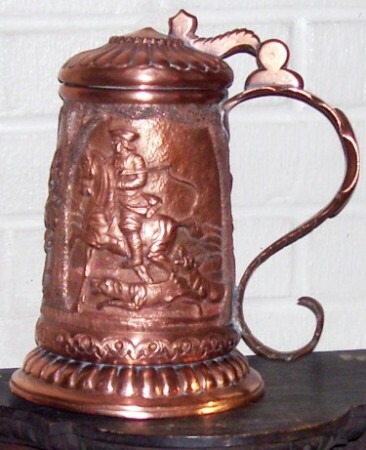 Most so called bronze steins found on the market today are just thick and heavy copper (see the “Hunter on horse” below) that have extreme oxidation. 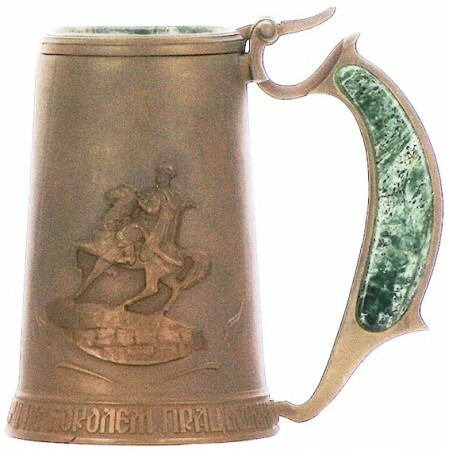 A newer (1950’s) bronze tankard from the Kiev, in the Ukraine. [FWTD] The scenes celebrate two of the city’s great monuments. 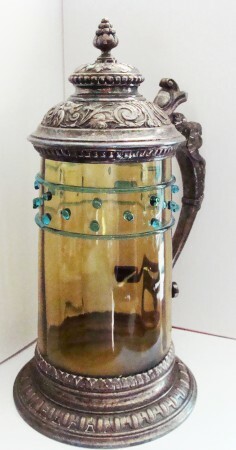 Malachite stone inserts in both sides of the handles and in the lid. 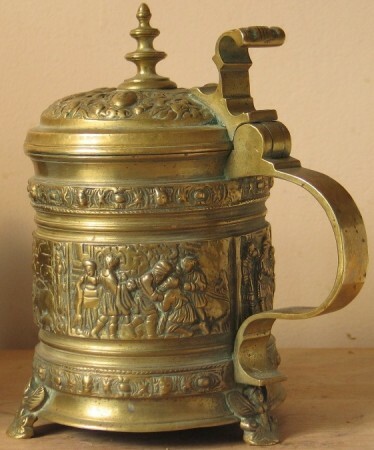 Bronze copy of Dresden’s Green Vault’s Ivory steins (sans finial.) [FWTD] It was probably made in or around Dresden as an expensive souvenir. 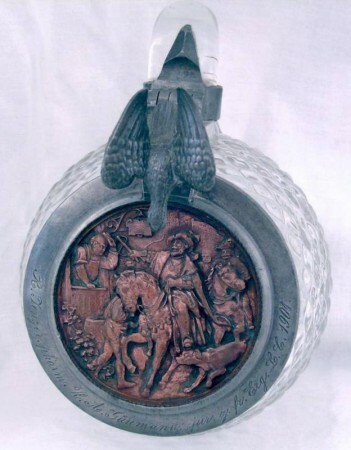 See the story under “Silver Tales” this web site. 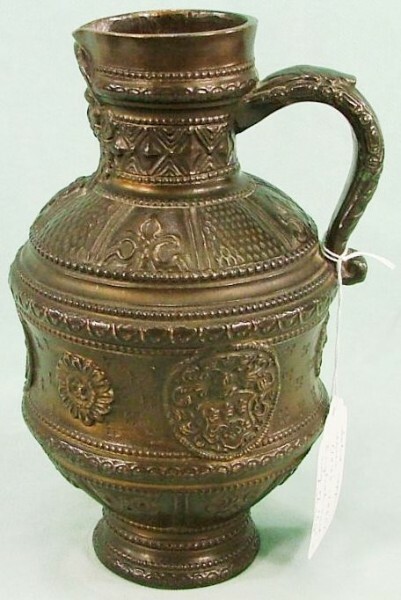 The indicator that this 21 inch tall bronze pokal [FWTD] was made in Italy, is the way the ‘Coat of Arms” (not really visible in the photo) is shown on this piece, and on another Coat of Arms on an exact piece I have a photo file on. 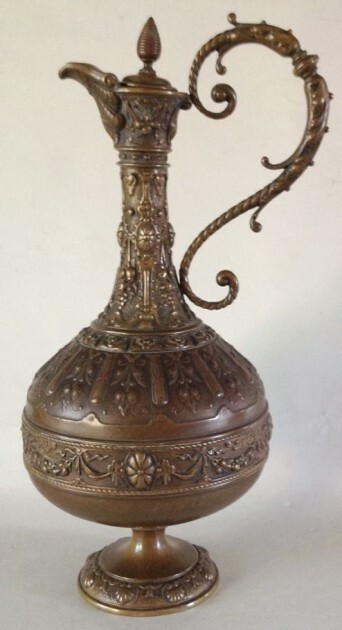 This 25 inch bronze pokal* was probably made in Munich (or Nurnberg) due to the glass being made and decorated by Theresienthal. The center bottom has the gold lined leaf design that that glass firm was so famous for. Circa 1890. 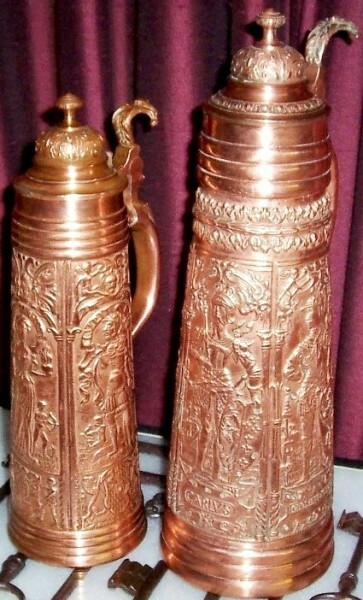 “Copper clad” steins are always German ceramic steins that have a coating of copper put on them by electro-plating. 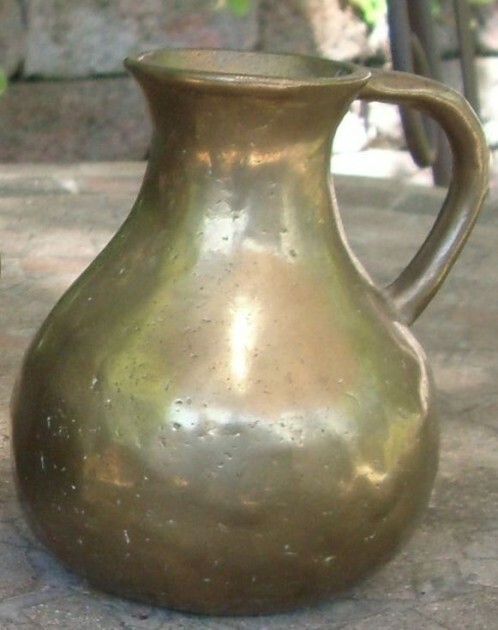 When left to oxidize, in time the weight of the ceramic body plus the outer copper shell makes them heavy and easily mistaken for bronze. 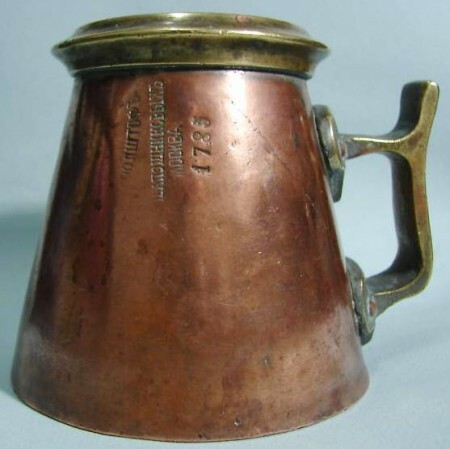 I am of the opinion that these were plated by an unknown British firm after importing the steins, especially made for them in Germany. 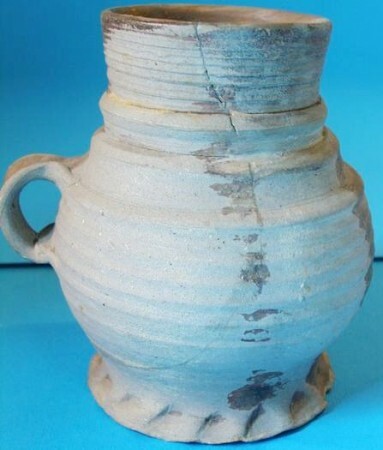 Several dozen examples exist including some copies of Siegburg stoneware piece from the 1500’s (See just below), but the idea of “copper clad” beer steins never really caught on. 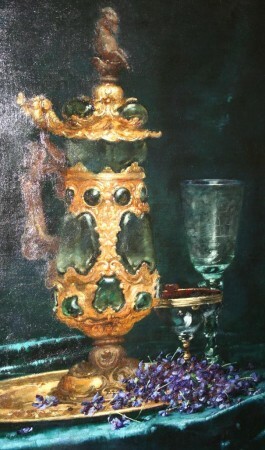 Circa 1890- 1910. 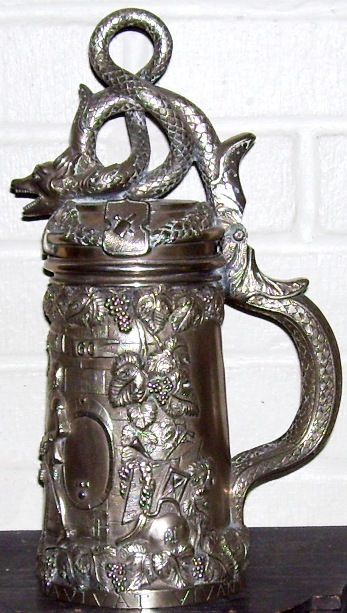 Late 1800’s German made copies of 1500’s Siegburg steins. 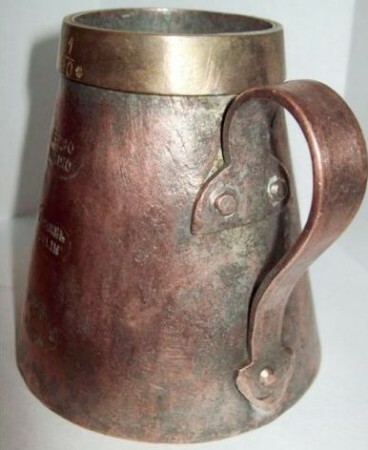 [FWTD] Which were then “copper clad” or “bronzed” Shined, they look like this. 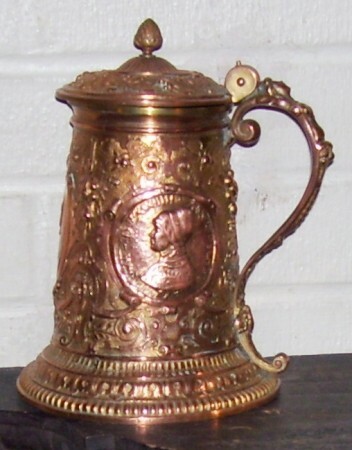 This “copper plated pewter” stein might be mistaken for bronze due to the weight. This one is from Stockholm. Sweden; F. Santesson made. The country’s Coat of Arms is engraved on the body front. Circa 1890. 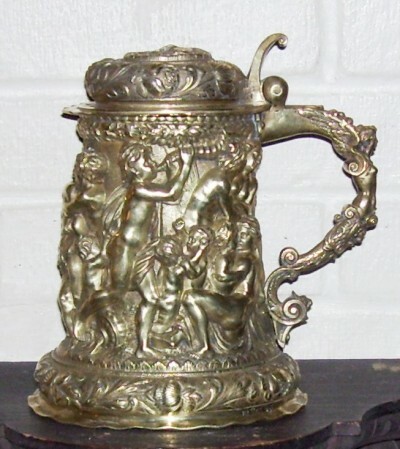 This “well thought of” beer stein (see oil on canvas just below ▼) was bronze plated over copper (or Brittania metal) [FWTD] , as it is a good and sturdy material. Plated pot metal = zinc, which a lot of faux bronze statues were made out of in this same time period would / will dent and bend easily. Circa 1880. German. Maker unknown. Art work of the above. 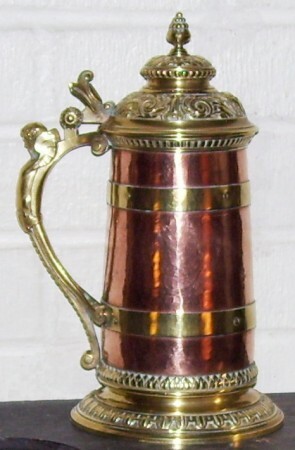 WEIGHTED COPPER BASED STEINS, WITH BRASS MOUNTS AND WORN AWAY SILVER PLATING. 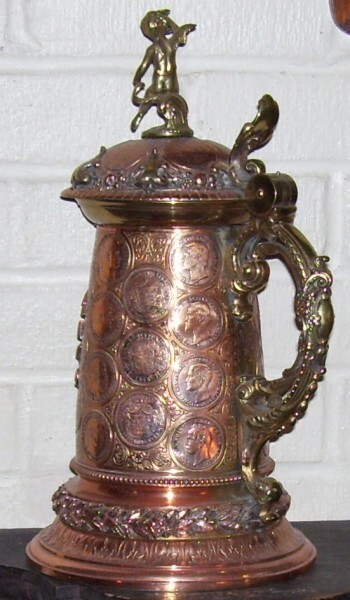 A “faux” coin stein done in copper with brass, and then silver plated. [FWTD] German. Circa 1870. These are heavy and when the plating is gone / worn off ( or stripped off!) as on these two examples they can be and often are, called “bronze” by the misinformed. Rear view of the above stein. A liquid (beer?) measure. [FWTD] These were used throughout the world to guarantee quantity. 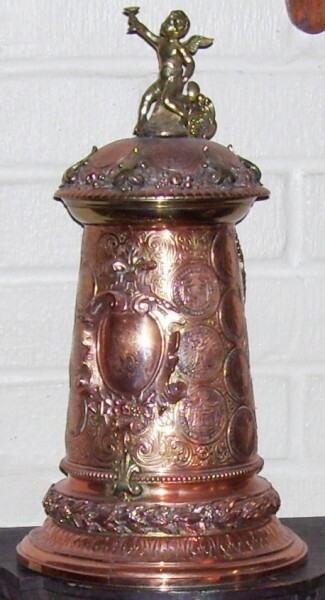 Copper base and rim with a bronze body. 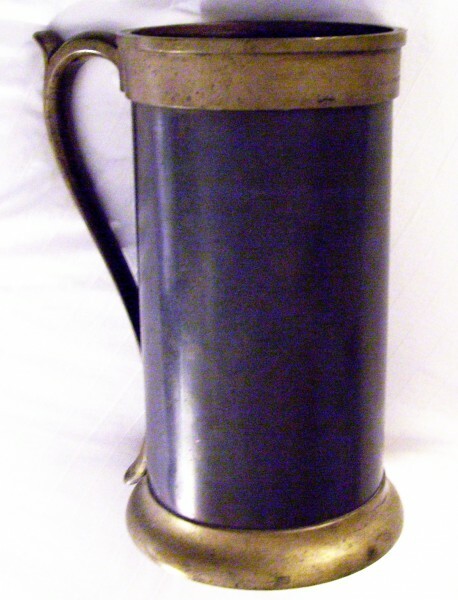 State of Ohio; one gallon; Circa 1910. Probably kept at a US brewery for quality control. 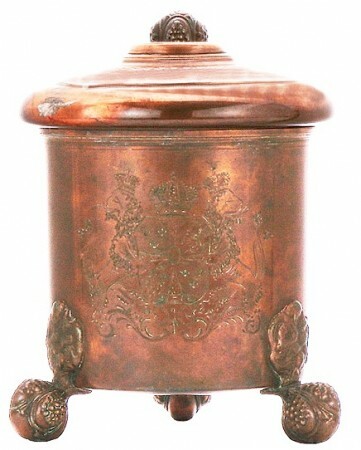 Shown below are two other smaller examples of bronze (and copper mounted) measures, essentially the same components. Top comes from Poland – Bottom one comes from Russia. STEVE’S SPECIAL NOTE ON THESE LIDS: DO NOT USE ANYTHING HARDER THAN A LIQUID SOAP AND A SOFT TOOTHBRUSH TO CLEAN THESE!! THE COPPER COATING [ON THE MOLDED SPELTER] COMES OFF QUITE EASILY! !